I've created a new comic website, called The Assault of Laughter. It was created as a place for me to drop miscellaneous art & strips, without necessarily having a theme or characters. I think it is already turning into something else, though. Hopefully a new comic (followed by more new comics) and a better title will be coming soon. It only makes sense to buy candy you like for the Trick-Or-Treaters. I mean, what if they don't show up? Who's going to eat all that candy? Having some fun with Halloween! Shark #2 of 2013's Shark Week: Bull Shark. This is helping me realize that I had gotten out of the swing of scanning and coloring. As I mentioned, the shark-a-day during Shark Week is great in that it forces me back into drawing something every day. I've also decided bull sharks are not amongst my favorite sharks to draw. Threshers and tiger sharks top that list. I am a member of a group on the DeviantArt! website that has a SharkWeek challenge every year. The moderator posts the name of a shark every day. Every day, everyone in the group draws and shares their version of that shark. I look forward to this; it makes me draw something every day. 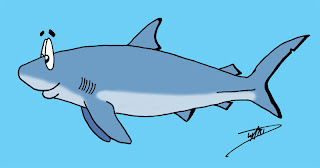 Today's shark was the Gully Shark, aka the Sharptooth Hound shark. One of the challenges of this exercise is finding good source material. Although I draw in a "cartoony/comic strip" style, I still try to get the basics of my sharks correct. This one was a tough one. I was unfamiliar with this species (found SE Africa, from Angola to S. Africa). My books were no help, and there were very few pictures on Google Images that weren't fishing photos. Anyway, I think he came out pretty well. Ok, nothing major. Just trying to get back to art. I decided to try to use Blogger as a tool for posting a small comic. I call it "Death Warmed Over", and it features, guess what, Death. I do not intend for this to be a regularly updated strip. I just know I have a few ideas, so I thought I would use Blogger instead of going through all the song and dance of setting up a whole web site for it. The first strip was done around Christmas time.